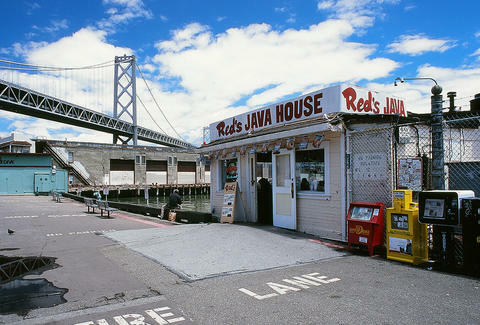 Red’s Java House is a San Francisco waterfront restaurant that opened in the 1930s, serving breakfast to the longshoremen and sailors. In a city where the ruthless competition for Michelin star ratings and world-famous chefs never ends, there are plenty of eateries you can go to for the most delectable food. Red’s is not one of them. Patrons go to Red’s for old San Francisco ambience, a bit of the bay, or a rowdy double cheeseburger and beer before the Giants game. I don’t think there’s a big to-do about the java either. 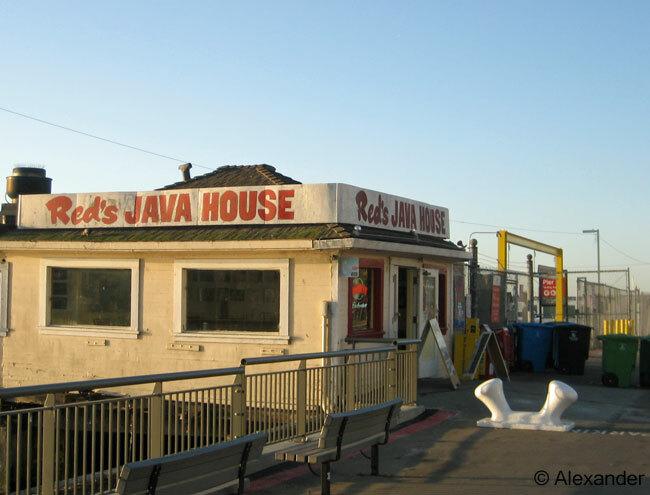 Located on Pier 30, Red’s Java House started out as Franco’s in the 1930s. In 1955 the namesake owner Red McGarvey bought it with his brother. There have been many owners since, but the name has not changed. In fact there is very little about Red’s that has changed over the decades. That is its charm. The interior is loaded with San Francisco memorabilia and ornery posters. There’s only one bathroom and the kitchen is tiny. It survived the longshoreman waterfront strike of 1934, and a big waterfront fire in 1984. 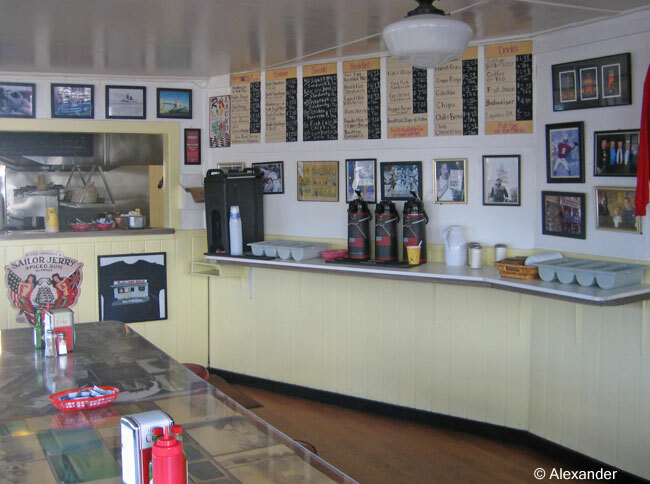 It also survived the 6.9 earthquake of 1989, serving coffee the next day despite no electricity. After that, the nearby Embarcadero Freeway was torn down due to earthquake damage, and Red’s was suddenly valuable waterfront real estate. The neighborhood began to change. Red’s survived the gentrification too. While the surrounding neighborhood turned into hipster restaurants and expensive condos, and working ships were replaced by cruise ships, the little shack on the bay continued attracting old regulars and famous San Franciscans too (like 49er greats Joe Montana and Jerry Rice). 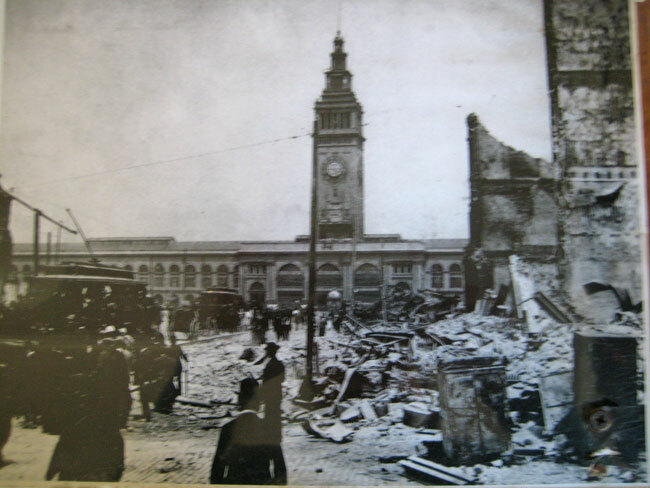 One morning I was near there at 5:00 a.m. for another San Francisco tradition–the 1906 earthquake anniversary. I was doing research for my new novel, Golden Gate Graveyard, due out next month. Afterwards, there was no place more appropriate for a San Francisco breakfast than Red’s Java House. The sun was rising and putting on a show outside the Java House window; the bay was calm, gulls were squawking. San Franciscans of old and new visit Red’s with a smile on their face, happy to see this spirited restaurant still exists. We take in the briny sea air and bellowing fog horns, and enjoy this crusty old shack. Very interesting history on the building. I’ve read a good bit and watched video of the aftermath of the earthquake. So terrible, amazing that the Ferry building stood strong. And the restaurant. San Francisco has a great spirit for all its rebirths after earthquakes. I’m glad you enjoyed the post, John. Many thanks. They have an outdoor patio and it’s really fun to sit so close to the Bay and relax while the rest of the world is in such a hurry. Thanks so much, Mike. LOVE coffee and San Fran!! And I loved this comment! Thanks so much, Laurie, happy to see you today. I’m with you, SWI — it’s always fun to find these places. The glass and chrome of bustling restaurants and excellent food is always fun too, but there’s something so embracing of life about the colorful character of a place like Red’s. I always appreciate your visits. Fun to visit a place with old charm, I am glad you liked it, Amy. Thanks very much for your visit and I hope you have a great weekend. It looks so inviting…I love the atmosphere in such old places.Luckily it escaped being demolished!Thanks for sharing this,Jet. Yes it was fortunate that Red’s lives on. Thanks Dina! I love places like this. I think every area has one, and they often times get overlooked. Thanks for sharing this one with us. If you are ever in SF Craig, check out Red’s, I know you’ll have a good time. Many thanks, my friend. I love little places like Red’s. I’m not much of a foodie so the ambience and history wins for me. Congratulations on the next book ready to be launched. I hope we will see a post about it soon! I am looking very forward to sharing my new book, Sue. It’s in production now, but I will definitely let you know when it’s out. Thanks so much. What a great place and story. Thanks, Jet. I know you would like it, Brick. Always a treat to have you visit. And it’s great to be right under the Bay Bridge. Thank you Cindy. Cool place. Let us know when your new book is out. I’m looking forward to it. Dear Sherry, thanks so much for your encouraging words. I look forward to sharing Golden Gate Graveyard with you. Sounds just like my kind of place!! It’s a lot of fun, GP, if you’re ever in SF. I thank you for your kind words, Amy. Thanks so much. Waterfront restaurants are a favorite and especially those with this type of character and history. I really enjoyed reading about this old shack and think it’s wonderful when places like this can survive through tough and changing times. I could sit at a waterfront place all day. I agree with you, ACI, it’s great when places like this survive. Really enjoyed reading about Red’s! Great history, full of characters with many a tall, and not so tall tale, no doubt. 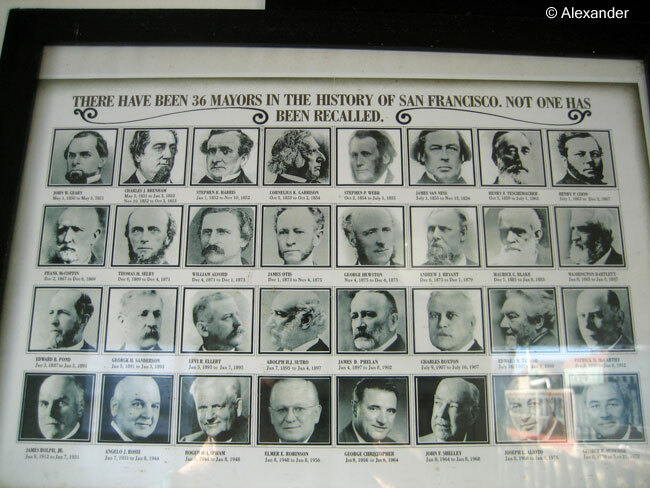 And we must have walked past it without realizing on our last SF visit – won’t miss it next time! Congratulations on the new book, looking forward to it. Yes, Red’s is really close to the Ferry Bldg, but oh there are so many things to look at there on the Embarcadero. You could spend 30 years there (which I have) and still not see everything. Thanks for your kind words about my new book, pc, I am excited to share it. Having a great weekend, hope you and Mrs. pc are too. I like your words about mingling with “old souls of the past” HJ. It is just that kind of place. Easy to imagine the explosive longshoremen strike of 1934 going on around there. I am happy to share Red’s with you, my friend. Many thanks for your visit, as always. Loved the storied history and the exceptional photo. Almost like being there. Muenchow family get together this coming Monday…..will forward some pics. Great info, Jet! I can’t wait to read your new novel and find out more about San Francisco, thanks! Thanks so much, BS, I know you will enjoy the new novel and SF culture too. Thanks so much. And what a treat it is for me to share the new insights and information with you, Val. Thanks so much for your continued visits and comments, they are much appreciated. With the upcoming publication of my new mystery novel, I will be posting a lot more about SF in the next few weeks. So even though you haven’t visited SF, Susan, you can visit it here. Many thanks for your visit here. What a great place Jet, it was great to learn about its history and atmosphere. Thanks so much, Andrea. From your posts, your writing, I always pleasantly enjoy the atmosphere of the places you visit; so I receive your comment here as a great compliment. Very interesting read Jet, sounds like a good place before or after visiting Pier 24, a great place to see photography exhibitions. Also very nice to hear your new novel is coming out soon! Thanks so very much for your warm comment, Bertie. 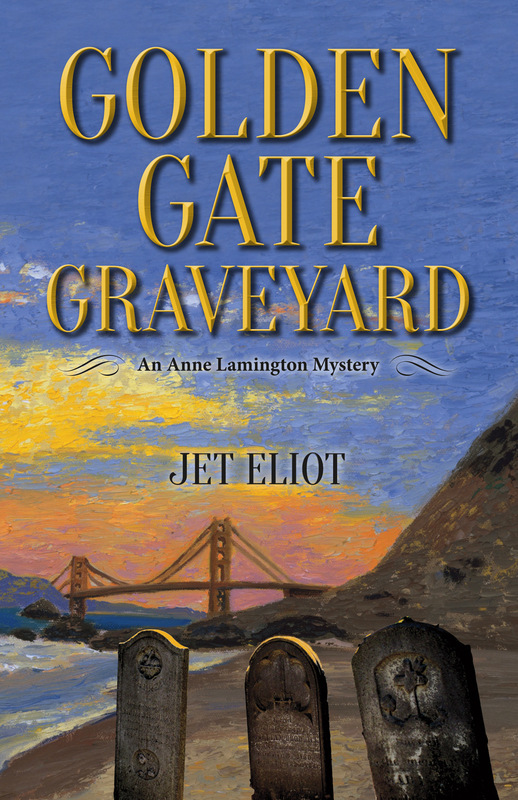 Look for Golden Gate Graveyard next month. I know you have visited SF, so I think you will enjoy it being set in a place with which you are familiar. I love this kind of places. They make me feel that everything will be all right 🙂 Good luck with your book! The Bay Bridge is overhead, the SF Bay is spread out before you…yes, truly a great place to kick back and welcome the day. Always a treat to hear from you, Bill, thank you. Knowing how much you like SF, Nan, I know you well enjoy the new book. Thank you for the re-blog, Mint Cream.